- NZD advances after solid third-quarter labour market report. - NZ unemployment hits decade low after jobs growth picks up. - NZD could now benefit from a less dovish RBNZ on Wednesday. The New Zealand Dollar advanced broadly Wednesday after official data revealed a sharp improvement in the labour market during the third-quarter that reduces the odds of the Reserve Bank of New Zealand (RBNZ) going ahead with an interest rate cut over the coming months. Employment grew and unemployment fell during the third quarter. And both at a pace that was much faster than the market had anticipated. But the rate of wage growth remained lacklustre during the recent period. New Zealand's economy saw employment grow by 1.1% during the quarter, a significant improvement on the upwardly-revised 0.6% growth seen back in the previous quarter that was also far ahead of the consensus for growth of 0.5%. This pushed the unemployment rate down 50 basis points to a post-financial crisis low of 3.9%, from a downwardly-revised 4.4% in the second quarter. Average weekly earnings including bonuses for full-time employees rose by 3.3% to $1,212. However, the labour cost index still rose by only 1.9% on an annualised basis, down from 2.1% previously and in line with the consensus. "Strength in the labour market is at complete odds with business surveys, which have declined to multi‑year lows. As we have said in the past, we believe the softness in the business surveys is reflective of the policy uncertainty of the current New Zealand government, rather than a weak economy," says Joseph Capurso, a currency strategist at Commonwealth Bank of Australia. Markets care about the labour market data because falling unemployment and improving job creation, according to conventional thinking on the subject, put upward pressure on wages. Pay growth leads to increased demand within an economy and exerts upward pressure on inflation, with implications for interest rates and financial markets. Changes in interest rates are normally only made in response to movements in inflation but impact currencies because of the push and pull influence they have on capital flows and their allure for short-term speculators. "For the RBNZ tomorrow: at 3.9% the economy has already achieved 'maximum sustainable employment'. Inflation is racing towards 2% sooner rather than later, and not just via energy prices. The RBNZ cannot avoid these simple facts at tomorrow's OCR Review/Monetary Policy Statement and needs to bin its rate cut scenario," says Annette Beacher, chief Asia Pacific macro strategist at TD Securities. The NZD/USD rate was quoted 0.26% higher at 0.6756 Wednesday, after having recovered from multi-year lows seen in early October, but still carries a loss of almost 5% for 2018. The Pound-to-New-Zealand-Dollar rate was down 0.04% at 1.9449 and has risen 2.4% this year. The Kiwi rose against all G10 currencies other than the Japanese Yen during early trading Wednesday. "The RBNZ is likely to look through the lift in the one‑year inflation expectations because of its transitory nature. But a combination of some hourly wage growth, fuel price rises and strong labour market outcomes means they cannot afford to be too complacent about New Zealand’s low inflation outcomes," CBA's Capurso adds. 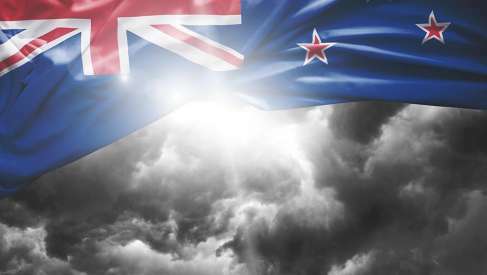 Wednesday's data and price action come just hours ahead of the latest interest rate statement from the Reserve Bank of New Zealand, due at 20:00 London time Wednesday, which will be an important moment for the Kiwi Dollar. Reserve Bank of New Zealand officials have warned in recent months that it could soon cut its interest rate if the economy does not gather steam during the second-half of 2018, dealing a blow to the currency. GDP data for the third-quarter will not be released until December but inflation and unemployment figures for that period have already suggested a pickup. Both TD Securities and Commonwealth Bank say the RBNZ may find it difficult to justify such a pessimistic outlook for monetary policy on Wednesday, when the economy appears to be in such good health. The RBNZ has held its interest rate at a record of 1.75% for almost two years, citing below-target inflation. The consumer price index has been beneath the midpoint of the RBNZ's 1% to 3% target for much of the last four years. New Zealand bond yields have fallen this year due to RBNZ interest rate policy, while U.S. yields have risen due to a stellar performance from the economy that has enabled the Federal Reserve to go on raising its benchmark rate. This turned the gap, or spread, between the two bond yields against the Kiwi and, in the process, created an incentive for investors to sell the NZD/USD rate. The NZD/USD rate had declined more than 7% during the 10 months to the beginning of November, as a resurgent U.S. Dollar has now converted an earlier 4% first-quarter loss into a 4% 2018 gain. However, this trend could soon go into reverse now the U.S. Republican Party has lost control of the House of Representatives in the midterm elections. Americans elected more Democratic Party candidates to the House than they did Republicans on Tuesday, leading to a divided Congress. This is expected to slow the legislative process and make it more difficult for the U.S. administration to get any further fiscal stimulus approved in Congress. President Donald Trump's tax cuts were instrumental in firing up the economy this year and it was U.S. economic outperformance that made the Dollar resurgent in the first place so the greenback may now be forced to cool its heels. That could provide other currencies like the New Zealand Dollar with some breathing space during the months ahead.